When assisting clients with decorating and styling their homes, sometimes all I have to do is simple fine-tuning to make a big design impact. The issues I tweak seemed to be common mistakes or challenges faced by many. Since correcting the mistake is the first step to achieving a well-designed home, I wanted to reveal 5 common mistakes & challenges which are crucial to fix in order to build the foundation for good decorating. The solutions below to these common mistakes will help make your home more fashionable & functional. These tips are meant to inspire you and enhance your lifestyle! When a rug is too small, it fragments a room and creates visual clutter. A rug looks best when it anchors a seating arrangement. Generally in a living room, the rug should cover all the furniture and extend about 6″ beyond the width of sofa on each side. Below are two options, to obtain large rugs without breaking the bank. Find a carpet with interesting print or texture and have the carpet store cut-to-size and custom-finish the edges. I have done that many times, and the right pattern or texture can make for a beautiful area rug. The leopard print rug in the third photo below is made that way. If you love a beautiful oriental or other expensive rug, you could go with a smaller piece and place a simple cut-to-size wool carpet underneath it, like the tan rug under blue oriental rug in the room above. A curtain that is too short, i.e. does not touch the floor, is akin to a person wearing pants that are too short (not the trendy kind!). It looks awkward and takes away from the beauty of the person, or in this case, the room. 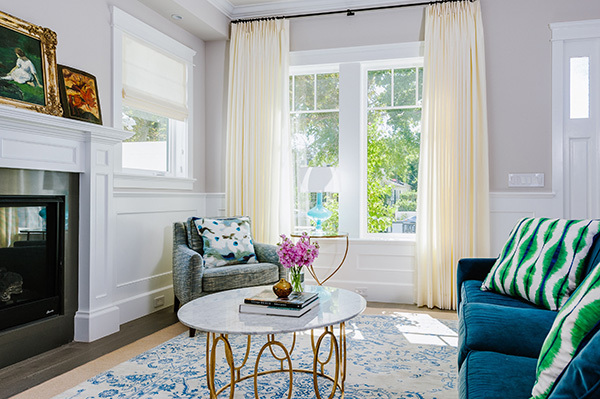 Opting for curtains that just touch the floor (as seen above), or adding an extra ½”-1” length like in the photo below is a great way to cheat the common uneven floor. When hung too high, art can look off-balanced on a wall and may inhibit your ability to enjoy viewing it without craning your neck. A rule of thumb is to hang a piece 60” from the floor to the center of art. For multiple artworks, the 60” mark will be from the floor to the center of tallest part of the arrangement. In the photo below, you would consider that height to be the distance from top of the large round mirror to bottom of frame underneath it, including the space between them. I like to lay this type of collage on the floor first to work out the arrangement and determine the overall height. 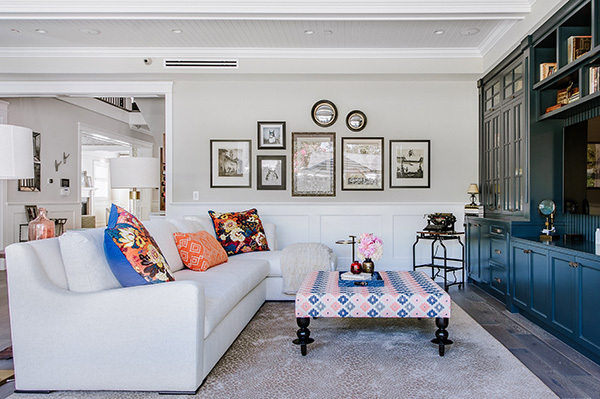 If artwork is behind a sofa and the 60” mark will overlap with the sofa, placing the piece so that the bottom is 6”-8” above sofa top is a good rule of thumb. I find that sometimes there is a misconception that stylish furniture cannot be comfortable. That is not true! Sure, there are many stylish uncomfortable ones available but you do not have to compromise function for fashion in order to create a fashion forward room. I believe fashion must meet function in order to enhance your life at home, and there are many options out there. Assess your lifestyle, what type of room is the furniture being placed in? List all the activities that will happen in the room and determine how you want to enjoy life there. For example, the extra wide and deep sectional above is in a family room for a couple who wanted the coziest & deepest sofa to curl up on and enjoy movies, or for the over 6-foot husband to stretch out and nap while the wife reads on the chaise end. Always test the furniture to determine if you will enjoy it for the lifestyle you envision. Besides firmness, also check whether the size and shape feels comfortable for your body. I have discovered that selecting the right sized chandelier and hanging it at the right height can be challenging for many, since it becomes a focal point in addition to being functional. 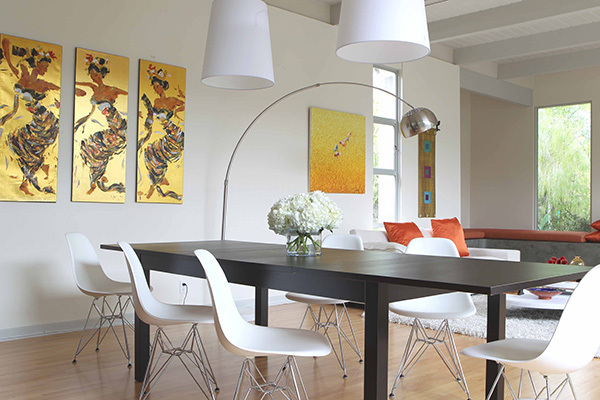 When opting for a round chandelier, go for a diameter that is at least three-quarters the width of the dining table. I usually like to go slightly bigger for added drama. If it is an extra-long table like the 10-foot table above, I like an elongated style, like the piece above, which is about half the length and width of the table. Another option is to get two ( round) matching pieces like those in the photo below. For chandelier placement, the lowest portion should be about 30”-36” from the top of dining table. I hope these tips will be helpful if you also encounter some of these common decorating challenges. Have fun making your home fashionable & functional!